Overcome complex organizational and technological barriers to enable true omnichannel transformation. Omnichannel is one of those words everyone uses, but few use correctly. It’s not another word for multichannel. It’s a different state of existence. In our experience, multichannel is the ability to interact with customers across many different channels, but not necessarily in a cohesive fashion. As new channels become available, they are “bolted on” to existing customer experience infrastructure such as CRM or customer support systems. Too frequently, the management of these channels becomes siloed (web versus in-store sales, for example). The effect of this from the customer experience standpoint can be disjointed and jarring. For example, the resolution of an issue following a customer conversation with an associate in the contact center may not be reflected when the customer goes online or into a store. Yet the ability to offer multichannel service experience is table stakes for today’s business. If you’re not available in the channels where customers want you to be, you cease to be relevant. And as we move further into a digitally driven ecosystem, multichannel won’t cut it for much longer. Salesforce reports that 75 percent of consumers expect a consistent experience wherever they engage with a brand. 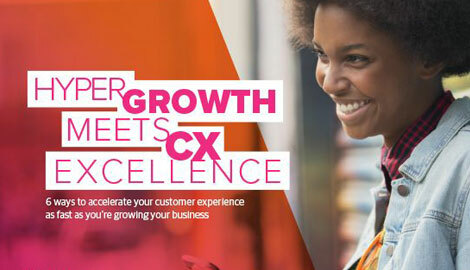 And as part of that experience, 95 percent of consumers use three or more channels in a single customer service interaction, with 62 percent crossing devices, says Forrester. This drives up the potential for inconsistent experiences, which could lead to customer churn. In 2017, 54 percent of customers walked away from a brand that delivered a poor customer experience, an increase of 5 percent over the previous year, according to Aspect. 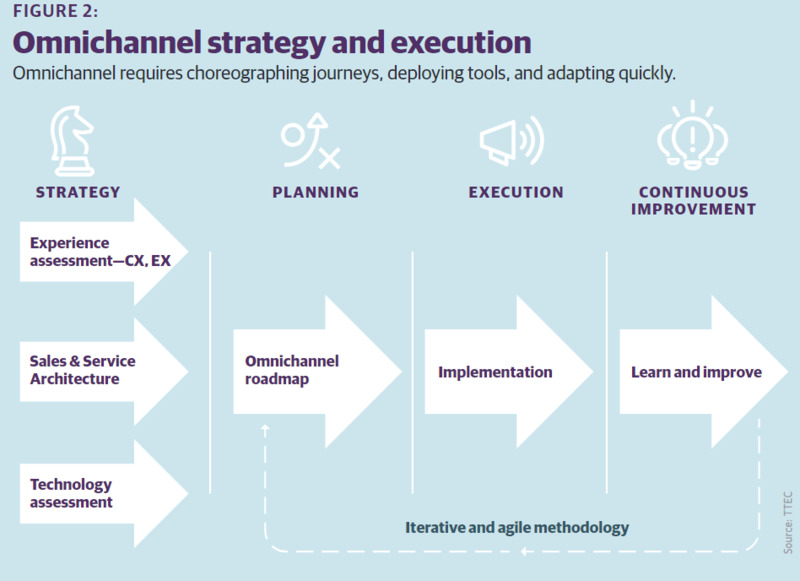 As digital transformation evolves, executives now realize they must create omnichannel experiences that are flexible and seamlessly flow among channels. 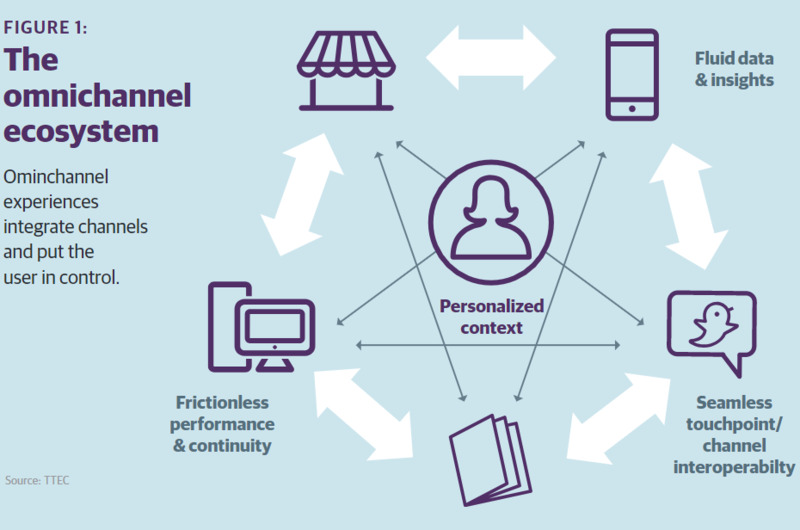 Omnichannel, in its most complete definition, means taking into account individual customer needs and perspectives to create seamless customer experience within and across multiple channels. The customer is in control, which creates amazing customer experiences and reduces friction for users and the business. With a true omnichannel experience, each conversation is a continuation from the last and customers don’t have to reiterate their problems multiple times to multiple people. It provides better insights into a customer’s next action, and it enables more personalized product recommendations and proactive outreach. Through technology and analytics, brands can improve their operational efficiency, optimize their channel mix, and take advantage of lower-cost channels, all while enabling a better experience for their customers. And the approach has proven ROI. Companies that deliver omnichannel interactions reduce customer complaints by 55 percent and increase annual revenue by 24 percent annually compared to others, according to a study by Aberdeen Group. Examples of companies delivering great omnichannel experiences are few and far between, with most happening in the sales cycle. Luxury retailer Neiman Marcus, for example, focuses on personalization and its famous “white glove” service in every touchpoint. It remembers user preferences for sizes and styles across channels and lets users engage with mobile apps and its “Memory Mirror” 360-degree sharable mirror in the store or online, with info transferring directly to its app. The Wall Street Journal also recently reported that its supply chain and customer care group joined forces to reduce delivery transit time to customers by 24 percent and help boost e-commerce sales. This is an often-overlooked part of the customer experience. But omnichannel isn’t just for retail. In the B2B space, we worked with a building material manufacturer that developed an omnichannel strategy by creating personas, then designing customer and employee interactions across channels based on those personas. Internally, the company created cross-functional pods of employees to manage inquiries from certain customer segments, leveraging their combined expertise for faster and more relevant issue resolution. As a result, even with 20 percent more calls coming in, first call resolution increased by 18 percent and the interaction resulted in four times as many sales follow-up opportunities. While these are just a few examples of companies delivering omnichannel experiences today, it will soon become the only way to do business. And for companies with legacy multichannel systems, or for those starting from scratch, it’s a tough road. There are complex organizational and technological barriers to success. • 67% had a lack of customer analytics across channels. • 48% blamed having a siloed organization. • 45% suffered from poor data quality. No clear ownership. A real omnichannel structure encompasses marketing, sales, service, back office, IT, finance, etc. It can cause ownership issues. Unless there are dedicated senior-level executives managing the entire scope of the project over multiple departments, an omnichannel idea will default into a multichannel reality. This may be the biggest obstacle facing businesses today. Paying for it. Without clear ownership, who pays for it becomes a challenge too. The business case usually spans the enterprise and can’t be segmented to one function. Turning vision into reality. Who are your customers and what do they want? It’s difficult to go from talk to action without that focus, and a lot gets lost as the vision gets disseminated and interpreted across different business units. You need a clear vision, but also be realistic about what it takes to make it happen. Innovation while operating. It’s a big challenge turning what you have into what you want, especially as the business continues to operate the day-to-day. Given today’s cloud-based solutions, it is much easier to incubate transformational experience that then can prove the business case for expansion. Speed and information flow. Information being in sync across channels is a big challenge when customers want real-time interactions and transactions. Companies must integrate fast-moving inventory, pricing, and transaction information for sales, and move that interaction info across channels for service. Planning for omnichannel incorporates many parts of the business. Decisions are influenced by and impact CX, business operations, IT, service, and marketing, just to name a few. Customer journeys must be choreographed and continuously evolve—in real time and over time. It is essential to have a clear view of how and where the transformation creates value for an organization and its customers. That value needs to be quantified and the path to realization set out clearly. In the digital world, the time to realization of value can be cut significantly. The kinds of data warehousing projects that took years to complete can now be implemented much faster through the use of technology such as APIs, cloud, and virtualization. Apps can be built in days or weeks, and the cost of computing and storage combined with advances in analytics techniques, such as machine learning, mean that actionable insights can, and in many cases, must be mined in real time to remain relevant. The digital omnichannel landscape may seem overwhelming at first, but the application of a few simple time-worn principles helps to make the process of planning, investing, and implementing less overwhelming. 1. Identify and prioritize higher value phases of the journey. Focus on creating manageable ecosystems for the process areas that create the most value. In the digital environment, it is much easier to extend the scope of any supporting infrastructure and process as you build out the total customer journey. For some organizations, enhancing quality of service experience may deliver greater payoff in the short term than focusing on acquisition processes. 2. Be agile in the approach to implementation. Borrow from the methodologies of today’s software development, adopting a more iterative approach to implementation versus a one and done. Capture value immediately by acknowledging that perfect can be the enemy of good, knowing that the experience will be improved over time. 3. Be bold enough to make big leaps when you can. While implementation can be iterative, the nature of the end experience should be differentiated and, at the very least, be functionally competitive. The benchmark for reshaping the experience cannot be internally focused. It is essential to review the marketplace and understand that the expectations of customers are shaped by their best experiences in any space, not from their memories of their most recent interactions with your organization. Making investments to optimize a bad or even average experience might be worse than not investing at all. Omnichannel success can’t be just a talking point anymore. It is becoming a business imperative, where both customers and the business benefit from the frictionless experiences it creates. Consumers will have their expectations met, driving higher retention, loyalty and acquisition. Companies will operate more efficiently with fewer siloes, streamlined processes, and integrated systems and insights. Don’t let barriers prevent your omnichannel success.